On April 1 there will be a launch for the anthology Love Hotel City: Twelve Authors, Twelve Visions of Japan, edited by Andrew Stevens of 3:AM Magazine and published by Future Fiction. The event starts at 7pm and is being hosted by Donlon Books at Bethnal Green, London E2. Check the shop’s website for details on how to get there. Love Hotel City, a US publication which is available from both Amazon.co.uk and Amazon.com, contains my short story ‘First Love’, which I read for the first time at the Horse Hospital’s fifteenth birthday party and has been made into entry number three in the Lonely Creatures series of no-budget short movies Howard Walmsley and I have been working on whenever we have a spare moment. There will be a major Lonely Creatures event at the Green Room in Manchester later in the year: more on this in the coming weeks. To complete the documentation of Requiem for the Network, an installation created in collaboration with Rathna Ramanathan for the Embedded Art show at the Akademie der Künste, here is a series of detailed views of the three main panels. The floating network of connections they reveal can be followed more closely by reading my essay ‘Requiem for the Network: Six Degrees of Devastation’ in the Embedded Art catalogue, published by Argo Books. The pictures above offer a wide-angle view on the location of the four panels of Requiem for the Network in the basement at the Akademie der Künste. This brief documentation gives some indication of how the curators have located the work precisely between the War Room on the ground floor, where the public can view the work by CCTV, and the corridor on the third level below ground. This attention to the positioning of the work expands the work’s presence, drawing attention to the way its design echoes organizational flowcharts, the complex weaves found in neural nets and the blast circles devised by RAND to plot the outcome of thermonuclear wars. From top to the bottom: KH in the corridor standing next to the panels of Requiem for the Network (photograph taken by Lillevan), two oblique views of the panels’ arrangement on the wall, and the work itself as viewed on one of the War Room screens, relayed from the basement via CCTV - you can see the camera used for this live feed positioned just behind me at the end of corridor in the top picture. I have no excuse whatsoever for posting this picture, except that it shows me, caught in the act of delivering my lecture ‘Welcome to the Labyrinth: Some Further Thoughts on Requiem for the Network’ at the Akademie der Künste last Saturday night, and the Brandenburg Tor – and all in the one shot too. It also brings back many happy memories of the evening – including the one of Heinrich Dubel of the Erratik Institute lighting fire crackers and throwing them off the Akademie balcony onto the square below to see whether the police would react (they didn’t). My thanks to everyone who showed up and took part in the event so enthusiastically – and many thanks indeed to Lillevan for taking such an evocative photograph. Every tourist should look like this. Below ground, the Embedded Art show emphasizes even more forcefully the concept of security as theatre. I was accompanied by animator and filmmaker Lillevan on one of the last guided tours of the exhibition – this is the only way to see some of the more restricted items in the show, including Requiem for the Network, the four-panel installation I created in collaboration with designer Rathna Ramanathan. Uniformed security guards (or at least their very obliging representatives) keep parties of visitors moving through doors that only open with the swipe of key card, forbid the taking of photographs and generally make their presence felt. As participating artists, Lillevan and I were allowed to break away from the main group and do some of our own documentation. ‘You’ve probably just blinded somebody upstairs,’ Lillevan observed in his usual charmingly discreet manner as I took a flash photograph of one of the CCTV cameras. I’d forgotten that these images feed straight back up to the War Room Lillevan and Zaji Chalem had designed for the ground floor. The exhibition space itself also formed a key element of the show: the basement rooms – useful only for storing non-valuable items of academy bric-a-brac – had been left pretty much untouched: the floor was raw concrete, the while walls stippled with paint flakes and staples, and the view up through the central gallery revealed heating ducts, wiring and insulation. 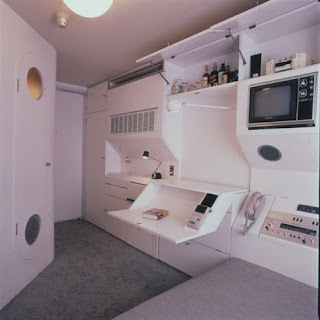 The overall feel is of a connecting suite of test beds or interrogation cells. ‘Requiem for the Network’ had an entire corridor to itself, the installation and the space working very dramatically together in the name of security as a bureaucratic precaution: something bland and maintained far from public view. More documentation on the work's installation in a following post. Pictures two and three show the CCTV cameras and an Embedded Art security guard in situ. 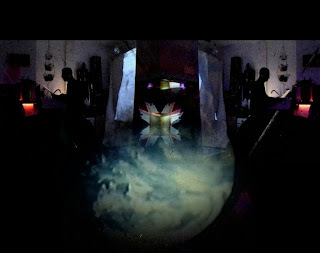 On either side of them in the sequence: KH and the rest of the tour stop at ‘Requiem for the Network’ (photo taken by Lillevan), and the view in the main underground chamber of the show looking straight up. The above images taken on the ground floor of the Akademie der Künste should give you some impression of how the Embedded Art show structured the experience of art and security to the casual visitor. The first picture shows the front of the Akademie during daylight hours – inside the main entrance was a sign instructing members of the public to ‘proceed in an orderly manner to check-in counter for more information’. Long lengths of incident tape, similar to the fragment captured in the second picture, marked out a clear path to ‘check in’, severely restricting access to the Akademie reception area, while long lines of tourist attempt to negotiate what appears to be an open space. Pictures three and four are of actual exhibits accessible above ground. One shows a detail of the extraordinary operations table in the ‘War Room’ created by Lillevan and Zaji Chalem. The other shows ‘Security Song: A Complete Analysis’ by Paul B Davis – the unattended item of luggage, left inside the main elevator, plays back a reassuringly jolly remix of Gershon Kingsley’s ‘Security Song’ over and over again, rendering any casual visitor to the Akademie considerably less casual than they were before. The next post will document some of things that were happening at the Embedded Art below ground. 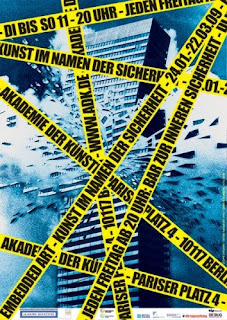 Yesterday evening Embedded Art: Art in the Name of Security ended its three-month occupation of the Akademie der Künste in Berlin. I was very pleased and proud to have been present for the last weekend of the exhibition’s run and to have given the closing talk in what was an ambitious programme of supporting events. Over the next few days I will be uploading pictures, notes and comments from what was an exhilarating and sleep-deprived two days. For the moment, however, I would like to commemorate the closing of an amazing exhibition and to thank Olaf Ardnt and Janneke Schönenbach of BBM, Moritz von Rappard and Cecilia Wee for all their hard work and commitment. The giant eyes that have been conducting night-time surveillance on Pariser Platz since January may have now closed for the last time, but the dialogue initiated by the Embedded Art show will continue for some time. Berlin remains, as always, a city to be watched. I will be giving at a lecture at the Akademie der Künste in Berlin on the evening of Saturday March 21, and the event will be open to the public so all are welcome to attend. The title of my talk is ‘Welcome to the Labyrinth: Some Further Thoughts on Requiem for the Network’ and will be an overview of my recent researches into the role that security plays in the daily running and expansion of the digital regime. The lecture is part of a programme of events supporting the exhibition Embedded Art: Art in the name of Security, curated by Olaf Ardnt and Janneke Schönenbach of BBM (Beobachter der Bediener von Maschinen) in association with Moritz von Rappard and Cecilia Wee. The subject of considerable press scrutiny and a CNN news report, Embedded Art includes the installation ‘Requiem for the Network: Six Degrees of Devastation’ – the product of my recent collaboration with graphic designer Rathna Ramanathan. The show is due to close this weekend – in fact, my lecture is one of the last in the programme – so you are advised to hurry if you wish to see this remarkable show. The lecture is scheduled to start at 20.00 hrs. The Embedded Art catalogue, featuring my essay ‘Requiem for the Network’ is currently available from Argo Books. 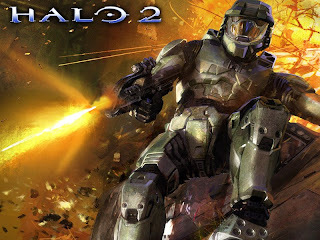 ‘Movies won’t matter anymore’ was a slogan used as part of the launch campaign first-person apocalyptic videogame Halo 2 – it implied not just the end of civilization as we knew, part of the game’s space invasion scenario, but the end of cinema itself as a medium. When Halo 3 was launched in 2007, the campaign slogan was reduced to one word: ‘Believe’. The shift in emphasis between the two campaigns indicates not just the ascending rise in importance of the videogame as an entertainment medium but also how significant the politics of simulation – the ‘virtual’ in digital terms – have now become. We shall also be looking at the impact animation design, particularly in Japan, has had on the simulated or virtual experience. As ‘god of manga’ Osamu Tezuka once declared: ‘We are living in the age of comics as air’. First appearing in print in 1947, Tezuka’s ‘irresponsible pictures’ changed the way audiences look at comics, not only in Japan but throughout the world as well. Stories are told at a faster pace and with greater economy and clarity as words increasingly give way to pictures. A living example of ‘single object-multiple use’, the impact of manga on the development of animation, videogames and information design has yet to be fully assessed. With the emergence of a ‘military-entertainment complex’ in which games designers, animators and sound designers collaborate to create more convincing real-time combat simulators and future war scenarios, not unlike Halo 3, perhaps the time for that assessment is already long overdue. Steven Poole, Trigger Happy: The Inner Life of Videogames, 2004 update – available as a PDF by clicking here. The Steve Poole blog is also worth subscribing to. Tim Lenoir and Henry Lowood, Theaters of War: The Military-Entertainment Complex, Stanford University, complete text downloadable by clicking here. William Burroughs and Anthony Balch: Towers Open Fire: a set of film and tape experiments made in the 1960s. Try not to be too amused by it – you may be old and cranky yourself one day. Simon Tyszko has just posted his extraordinary film of the Welcome to Mars reading I gave at Phlight last December. By a deft series of superimpositions and elisions, mirroring images and overlaying sound, he has transformed the documentation recorded on the night into a scintillating and beautifully compact version of events. You can find this on the video page of the Phlight website or by clicking here. ‘It’s a 50-minute video,’ Simon warns in a recent txt, ‘so it may not be YouTube fast.’ Bring popcorn. The April 2009 issue of Fortean Times – the only FT that currently matters in these financially depraved times – has run a highly positive review of Welcome to Mars, giving the book a 10/10 rating: something apparently quite unprecedented in the history of its book page. Caesar be damned – praise from Fortean Times is praise indeed. Security, like eroticism, is a state of affairs: something we inhabit rather than actively participate in. To offer representations of either is to diminish their significance – which is why I am pleased to note that the main body of the Embedded Art Catalogue , published by Argo books, has no images in it whatsoever – just black letter text, leavened by the occasional short slug of text or reference in red. All the essays – including my own ‘Requiem for the Network: Six Degrees of Devastation’ – have been set in a bold typeface, creating an impression of heaviness and suppression that practically seeps out from the pages. This isn’t a book for reading – it’s for running as scrolling banner headlines on CNN. To comprehend the full measure of its content you would have to encrypt it first. Accompanying the exhibition at the Academy of Fine Arts, Berlin, curated by Olaf Arndt, Janneke Schönenbach, Moritz von Rappart and Cecilia Wee. As the waves of international terrorism reach vital organs all over the world at the beginning of the 21st Century, new threats curtail the dream of a peaceful, undivided and secure world. In response to these circumstances, state and private organisations across the globe are producing new tactics, strategies and technologies to fight the dangers threatening our democracies and jeopardising our understanding of the term “civilisation”. Indeed, everything that can be performed “in the name of security” appears desirable: security has now become an ideology. The publication “embedded art. Art in the Name of Security” interrogates these pressing issues, appropriating the words of composer Gershon Kingsley to ask its audience, “what would you give for security?” As a reference book to the subject, the publication compiles cutting-edge contributions by sociologists, historians, media artists, political and cultural scientists such as Peter Bexte, Alfred McCoy, Steve Goodman, Ken Hollings, Wolfgang Pircher, Florian Rötzer und Steve Wright. Includes a DVD with contributions by the participating artists. 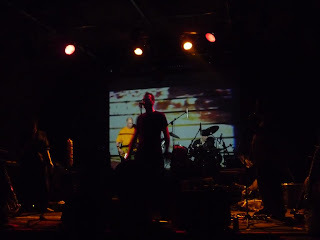 Graham Massey has emerged from working on the upcoming Sisters of Transistors album long enough to complete final mixes of the two live sets Biting Tongues performed at Shunt Vault last November 21. One track – a super-nasty version of ‘Heart Disease’ recorded on Friday November – has just been added to the Tongues MySpace page and is well worth visiting. The Tongues Friday-night set started way after midnight, and by the time we came to this part of the performance, around 1.00am, most of our audience was in an advanced state of chemical modification. Down in front of the stage I swear I saw some people trance-dancing while others were playing air guitar – and there was one guy writhing around on the floor who seemed to be attempting both at the same time. It made you feel glad to be alive. Also just posted on YouTube by Howard Walmsley is a montage of clips and music from Feverhouse, the movie we worked on together and which was later released on video by Factory Ikon. Feverhouse had its first screenings at the Riverside Studios and the Royal Northern College of Music, before a two-week run at the ICA. Howard is currently in the process of setting up a Biting Tongues TV page, which will feature some live and archive footage, together with a final edit of ‘The Dragman’, a new Biting Tongues video storyboarded by Howard and shot at various locations in Beijing a couple of years ago. A version of the video's soundtrack is currently available from the Tongues MySpace page – simply click on ‘Dragman 2008’ to hear it.